The "Ark of Taste” catalogs some of the world's rarest food, ingredient, and techniques. Here, we take an in-depth look at a selection from 3,500+ endangered items on the list. More than 60 million American Plains bison once roamed North America. By the late 19th century, just 1,000 remained. This animal is just one item on the Ark of Taste, nine of which are featured in this article. The Ark catalogs more than 3,500 endangered products from over 150 countries (200 of which are from the U.S.), nine of which were showcased at the Denver gathering. Modern Farmer took the time to learn the histories and current issues surrounding each, and to meet with proponents of each item. Let’s learn more. Born from the Santa Clara Valley in California in the early 1900s, the Blenheim apricot once enjoyed heavy planting periods. The tasty stone fruit ripens later than other well-known varietals, a quality that contributed to the demise of this once-dominant crop, which declined in sales in competition with other, quicker-maturing strains. Native to the New York City borough of Queens and dating back to 1730, the Newtown Pippin apple varietal is known as a late-harvest pick. With its multi-hued skin, piney notes, and a balance of sweet and tart flavors, the Newtown Pippin only gets better with age, which gives it cider appeal. Strains of the Northeast and Mid-Atlantic U.S. are typically a greener and more acidic and flavorful variety when compared to those of the yellow variety, which are commercially harvested in California. Known as a favorite of Founding Fathers like George Washington, Benjamin Franklin, and Thomas Jefferson (he grew the apples at Monticello), the strain was also highly coveted by Queen Victoria, who lifted the import tax, which contributed to the decline of its commercial presence. In addition to its New York roots, the choice-cider apple also grows regularly in Michigan, specifically on Blake’s Orchard & Cider Mill in Armada. Hand-selected by Colorado-born Stem Ciders, the Newton Pippin was recently chosen as a feature for a limited, quarterly release. “Both of our co-founders are from Michigan, which is a rich cider apple area of the country,” says Courtney O’Rourke, director of marketing and cider relations. “Our co-founders have known these growers for years, and we really try to foster relationships with growers, both locally, and throughout the country. “I think it’s important to support our farmers and our community – no matter what they are growing – to keep our food supply sustainable,” she shares. Perhaps one of the most crucial items on the list, the American Plains bison once roamed North America in herds totaling more than 60 million. Reaching nearly 2,000 pounds at maturity, this multifaceted herbivore was once a vital resource to Native American nations, supplying tender, sweet meat, along with raw materials to create a plethora of products, from clothing to tools to shelter. However, it was the Euro-American westward expansion of the late 19th century that led to the demise of the once-bountiful bison. Widespread hunting habits resulted in the survival of just 1,000 bison. 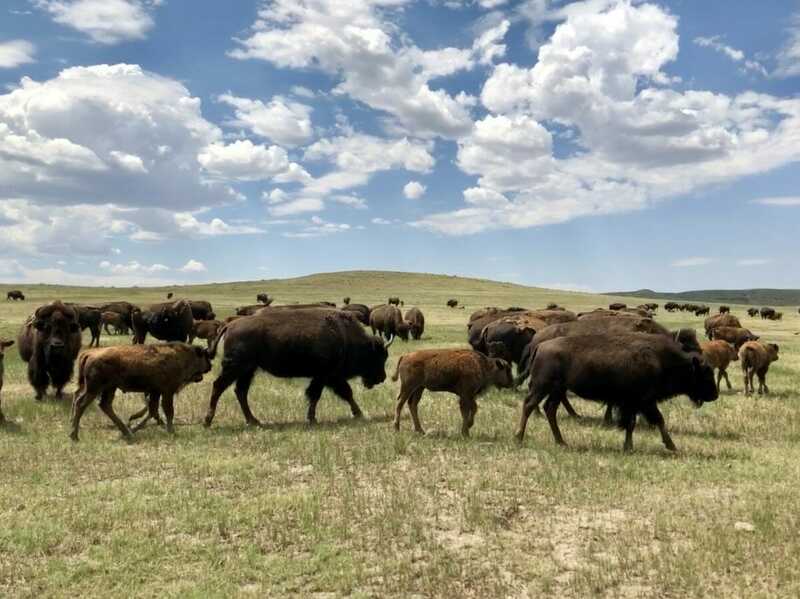 But today, thanks to the combined efforts of traditional tribal nations, ranchers, and public landowners, bison are finally thriving once again. Native to the leeward side of Hawaii and exclusively from the flowers of the mesquite Kiawe tree, white Kiawe honey dates back to 1829, when a Catholic missionary brought the first tree to the Big Island. The one tree spawned the growth of a 150,000-acre nursery, and with it, a type of honey derived almost entirely (we’re talking 99 percent) from Kiawe tree flowers. For more than 100 years, beekeepers have been working with the trees to make this creamy, vanilla-almond-flavored honey, which earned its spot on the Ark because this one grove is the only production site in the world. Carla Marina Marchese, founder of the American Honey Tasting Society, is a strong advocate of this varietal. “Given a female worker honeybee only produces one-twelfth of a teaspoon of honey in her lifetime, honey is precious and quite rare,” she says. “By consuming Kiawe honey, we are sending a clear message that it is essential to preserve bee forage to ensure healthy, productive honeybees.” Put another way: If there’s no market for this rare and delicious honey, there’s no reason to preserve the grove, let alone expand and plant more. Another bonus of the Kiawe tree? It’s more tolerant of salt water, a trait that plays a role in helming desertification, a growing, global threat. True to its namesake, the California Mission Olive was born from the missionaries who planted its trees in the late 1700s. However, little effort was made to confirm that newly sprouted trees were derived from the originals. The recent discovery of an original grove has since birthed a revival of the authentic trees. While California now has many conservation efforts in place, olive oil producers have joined the movement, with the hopes that the demand for their product will help propel the recovery mission. Known for its native subtly, Pure Kona coffee is grown in both the north and south districts of Kona, Hawaii. Pure Kona coffee production began in 1828, and saw an expansion with the development of local Kona farms, thanks to Japanese immigrants, who built the “Kona Coffee Belt,” a 22-mile-long, 2-mile-wide plantation. Deceptive labeling is what puts Kona at risk today, due to the formation of Kona blends, which have large makeups of foreign coffee bases of up to 90 percent, harming the prosperity of Pure Kona. Local producers are fighting against Kona becoming a generic coffee term, including organic Kona coffee farmer Colehour Bondera of Kanalani Ohana Farm in Honaunau. “To this end, if folks have influence on – or with – residents of Hawaii, pressure must be put upon current legislators to support the Kona Blend Bills being considered; that would shift the name-use from requiring 10 percent to a minimum of 51 percent, in order to carry the Kona name,” says Bondera. “Since agriculture is often political to varying degrees, and in this case quite directly, consumers who purchase directly from producers can – and should – request of their Kona coffee producers to strongly push the legislature.” Bondera says whether Pure Kona coffee remains viable all comes down to where financial support is directed. In 1999, Slow Food entered the production space with the launch of the Presida project, which is a program that serves to promote products on the Ark of Taste list – specifically the people who make them, and their associated knowledge and skills – and to encourage quality production in the name of traditional processing, while safeguarding native items that face extinction. Now utilized as a tool to demonstrate Slow Food’s stance on biodiversity and agriculture, there are currently more than 500 Ark of Taste products reaping the benefits of the Slow Food Presidia initiative, which organizes training activities, provides promotion and support, communicates the product to the public, and creates a platform between producers and the rest of the world. One of those products is Chontalpa cacao, named for its region of origin in the Mexican state of Tabasco. Reliant upon this cacao bean for their livelihood, the cultivation and consumption of Chontalpa cacao supports the natives to this day. In fact, 67 percent of Chontalpa is dedicated to producing this crop, while Tabasco is accountable for 80 percent of Mexico’s overall chocolate production. Local, small-scale producers of the cacao are plagued by various issues, from lack of credit to their distance from customers willing to pay top dollar for the product. Access to assistance, equipment, and production are also major issues for growers, as were the 2007 floods that wreaked havoc on the region and its crops. It was following those floods that Slow Food got involved with the local cacao economy, including the integration of new practices and policies now in place, and the addition of the product on the Presidia list. And, thanks to the Presidia inclusion, a Boulder, Colorado-based Chontalpa cacao chocolatier was born. “Fortuna Chocolate is the result of human connections; with chefs, with eaters, and with growers. A couple of years ago, we celebrated the 20th anniversary of Slow Food [at Terra Madre] in Turin, Italy, and were introduced to producers growing in the Chontalpa region working with Slow Food Mexico,” says Sienna Trapp-Bowie, co-founder of Fortuna Chocolate. Also, a Presidia initiative under Slow Food is the indigenous sockeye salmon, a food mainstay of the Sylix, and at the center of trade between the indigenous people, the southern Interior of British Columbia and Washington State. Spawned along the Columbia River, the Okanagan sockeye salmon provides nutrition not only to the people of its region but to the wildlife that inhabits the land. In addition, the decomposed salmon further fertilize both land and water. Known to be eaten fresh during the season (June through September), and preserved as either sun-dried or smoked, the salmon also keeps well frozen for future use. In the 1930s, International Water Agreements took a toll on the salmon population with the launch of hydroelectric developments settled along the Columbia River. This created an impasse for the fish, which lead to the devastation of the breed, which was near extinction. In 1996, leaders in Okanagan banded together to take responsibility for the land, and its waters, to restore the sockeye salmon. In 2014, an estimated 600,000 salmon returned to the Columbia River, where the breed is now carefully harvested to ensure its flourishment. “It is our job to care for – and protect – our salmon, not only for our people but all people. It is part of our indigenous sovereignty and our overall food security,” says Pauline Terbasket, executive director of the Okanagan Nation Alliance. “It is our responsibility to care for our land and our waters to provide a sustainable livelihood for our children and future generations.” Terbasket cautions consumers to learn where their salmon comes from and how it is being caught, because this decision affects the fishermen and the harvesters, in terms of fair food and how they are being compensated. “Know the land in which you live and travel, because indigenous people were once there, and the land provided,” she adds. Black soy is indigenous to the fertile lands of Taiwan, specifically in Hen Chun, in Pingtung Country, on the southernmost portion of the island. Thanks to the sub-tropical climate, high-quality cultivation ensues, providing the most flavorful of soy sauces. The single-most ancient condiment to Taiwan, black soy sauce is now mainly produced from the importation of soy seeds, because there is not enough harvesting on the indigenous land to support the demand. Artisanal production, in particular, is scarce and has lessened due to the mass production of soy sauce. The traditional process includes bouts of soaking, stewing and rinsing the black soybean, specifically Tainan No. 5, followed by a 180-day fermentation period. The final sauce is then diluted with mineral water, and the leftover soy is repurposed as fertilizer. For more information about the Ark of Taste, visit the Slow Food website.